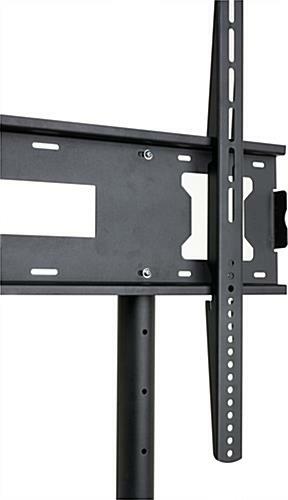 Mount is height adjustable between 46” and 61” (from the center of bracket) for an ideal viewing level. 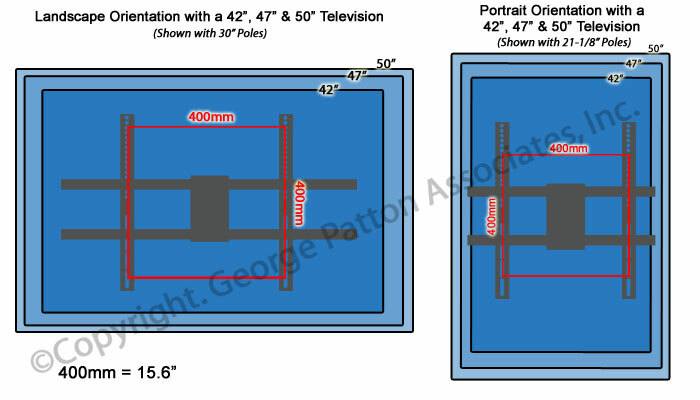 Two shelving units for audio visual media accessories such as projectors, DVD, and VCR players. 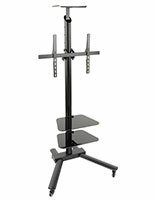 One height adjustable camera shelf for interactive video conferencing. 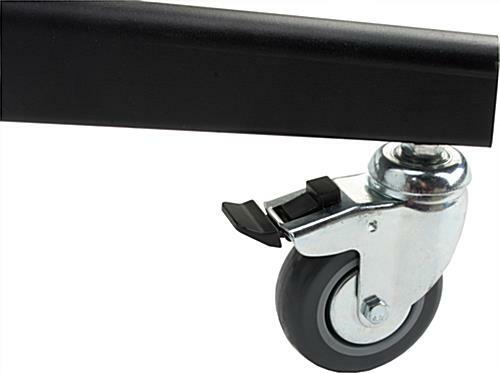 Features two lockable caster wheels for mobility. Accommodates monitor screens between approximately 40"-80" under 110 lbs. 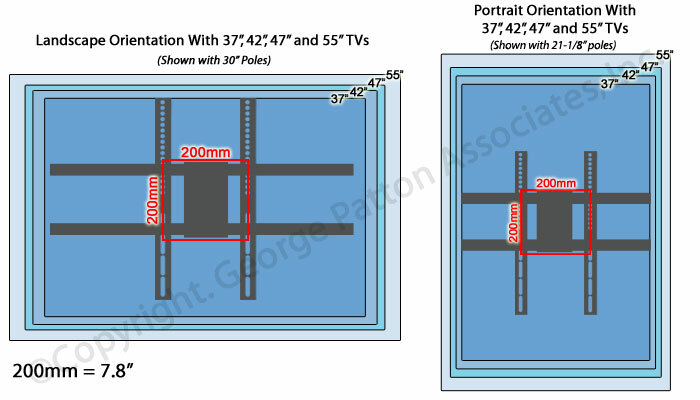 VESA compatible for monitors between 200x200 up to 800x600. 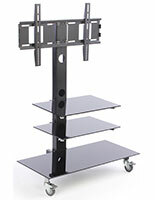 This flat panel TV cart, such as the mobile screen mount, is great for commercial use. Each LCD stand is an industrial design to safely and firmly secure large screen monitors and hold audio visual equipment. 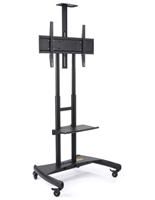 This AV flat panel TV cart is ideal for corporate offices, educational institutions, trade shows, medical facilities, and the like! This entertainment stand is a commercial fixture for any environment looking to communicate information through electronic systems. 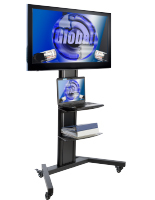 This durably built steel flat panel TV cart is a long lasting fixture that will act as an interactive tool for presentations, learning, and advertising. 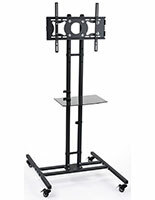 The plasma screen stand provides a professional look for any commercial setting. 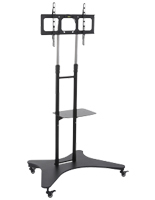 This LCD floor mount, a flat panel TV cart features a rolling base for a mobile audio visual stand. Each mobile LCD stand has a durably constructed pedestal so transporting the unit to different rooms is safe since the design prevents tipping. 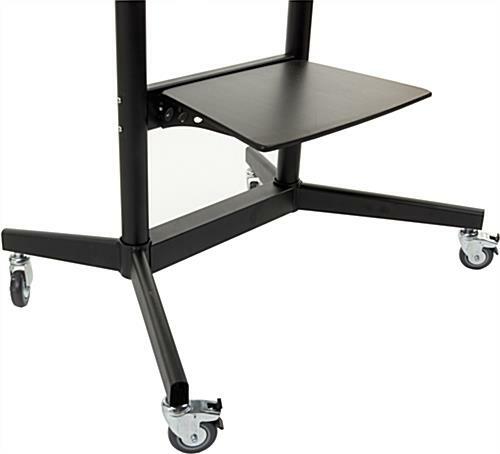 Also, this flat panel TV cart that is office furniture features two locking caster wheels so once the stand is in the desired location it is sure to stand upright and stationary for an impressive interactive display. 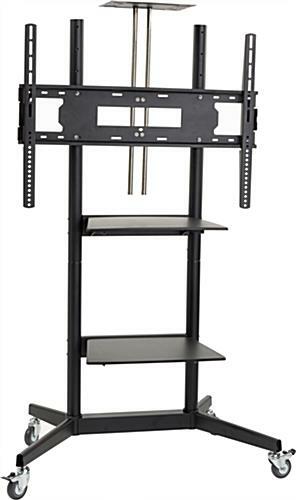 This plasma screen stand includes two shelves that can hold additional audio visual equipment. 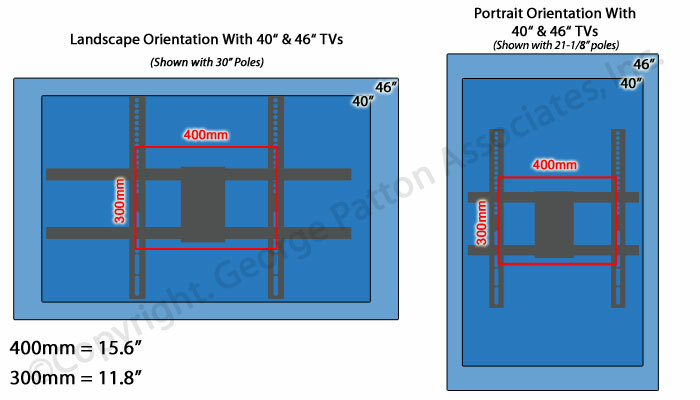 Each flat panel TV cart that has ledges for media can help display a selection of materials including meeting notes, small projectors, DVD and VCR players. Additionally, each monitor mount that is office furniture has a camera shelf which is great for video conferencing. 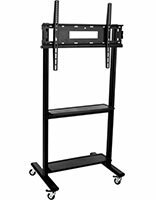 This flat panel TV cart that has an integrated bracket helps increase visibility for presentations, advertising, and overall display. 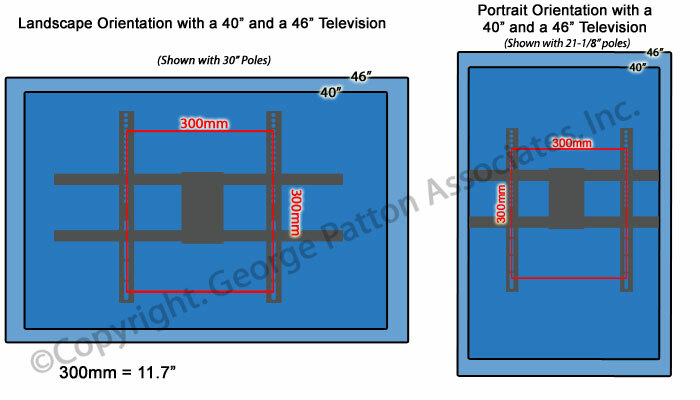 The mounting fixture can accommodate a wide range of VESA sizes for the common LCD monitor. 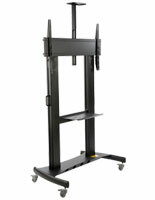 This flat panel TV cart holds a plasma screen 40"-80" large for display. 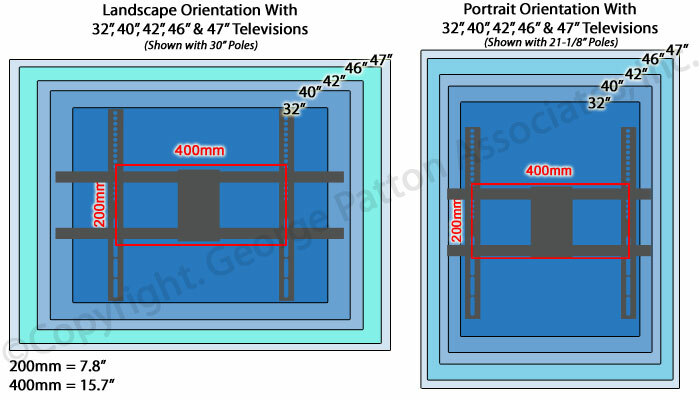 Compatible VESA sizes include all monitors between 200x200 up to as large as 800x600 making this stand an otherwise universal audio visual plasma screen mount! 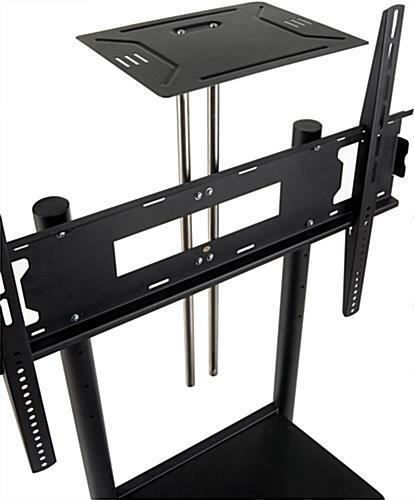 This monitor display stand ships unassembled to save on shipping costs and is complete with all hardware except a basic screwdriver which can be found at any local hardware store. Invest in this affordable advertising and display tool today! 34.5" x 80.0" x 25.0"
33.5" x 24.8" x 1.0"
Excellent product, In am extremely happy and satisfied with this purchase, fast shipping, easy assembly, very robust and strong TV frame. Saleha, thank you so much for the excellent review! 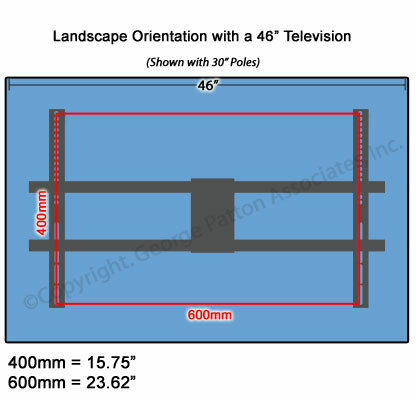 We strive to provide high-quality, easy-to-use products, and we're thrilled that this TV frame met your expectations. Hi Sandy, We're sorry to hear your order was missing parts! One of our customer care specialists would be happy to assist you with this. Thank you for letting us know! We're so glad we had just what you needed, Harrel! We hope you shop with us again soon. I'ts our third purchase, for Videogaming in the library, and we are about to buy another one. Small footprint, sturdy, with shelves to receive your equipment. Thanks for the feedback and for sharing your photo!